Since these two projectors were reviewed and compared last August a lot has happened. A whole new flock of inexpensive 4K projectors has hit the market this year. The Optoma UHD60 has dropped in price from $1999 to $1799. The Epson Home Cinema 4000 moves back and forth in price between $1999 and $1799 (its current price at this moment), depending on promotions active at the time. Beyond this, Epson released a significant firmware update in December that improved the 4000's overall HDR performance, which we had found a bit lacking last summer. So it is time for a reassessment of these two models in the current competitive landscape. Hence this update. The Epson Home Cinema 4000 and the Optoma UHD60 are both 4K-enabled home theater projectors in white casework. And this is where the similarity ends. There could not be two more radically different projectors in terms of both 4K technology and features/functionality. The Epson Home Cinema 4000 is essentially a Home Cinema 6040UB/5040UB with a different color compensating filter and the lens iris removed, two changes which affect contrast and lumens. It accepts 4K native signals and displays them with pixel-shifting on native 1080p 3LCD panels. This technology does not display native 4K signals with quite the same precision as the 4K UHD DLP chip, however it does produce a very sharp image that looks substantially higher in resolution than you'd expect to get from the native 1080p chips that produce it. The Optoma UHD60 uses the 0.66" 4K UHD DLP chip in order to maximize picture resolution with 4K source signals. Optoma was the first maker to bring the 4K UHD DLP chip under $2,000 with the UHD60. But in order to hit that price point last year they incorporated just the bare essentials with very few features other than 4K display. The UHD60's chip uses pixel shifting too, but it has 2716 x 1528 mirrors on the chip, or double the elements compared to a standard 1080p device. In practical terms it generates a picture that, with film/video subject matter in home theater use, is indistinguishable in resolution from a native 4K projector. Thus, with a 4K signal, the Epson 4000 produces a remarkably sharp, close approximation of a 4K image, and the UHD60 produces a noticeably sharper 4K image. The difference is particularly visible in fine hair and fabric detail when the two images are viewed side by side. The results are somewhat different with HD 1080p video sources. In this case both projectors are upscaling the native 1080p signal to approximate a 4K picture. Practically speaking there is not much difference in the results on these two models, and sometimes the Epson 4000 actually appears to be the sharper of the two. But it would be a mistake to consider the differences to be of any consequence. Both projectors make 1080p source material look a lot sharper than it does on native 1080p projectors. HDR Performance. On its initial release last year, the HC 4000 was not performing as well as the UHD60 with HDR-the picture just was not very bright. However Epson released a firmware update in December that improved the HC 4000's HDR performance, making it more competitive with the UHD60 in HDR than it had been. It is difficult to compare these two since both can be set to deliver HDR pictures numerous ways. On many projectors, HDR is a unique color/gamma/brightness preset that kicks in when the projector sees an HDR signal. But on the HC 4000 there are four independent HDR calibrations of color, brightness, and gamma settings, and these in turn can be applied to any of the standard color presets-Dynamic, Bright Cinema, Cinema, etc. Those in turn can be set to High, Medium, or Eco lamp modes. If you activate HDR in Bright Cinema mode, you get a brighter HDR picture than you do if you activate HDR in Cinema mode. On top of all that, the Epson 4000 has five different levels of 4K Enhancement processing, each increasing level of which boost perceived sharpness of the image. It is a matter of taste which level you might prefer. Meanwhile, the UHD60 has only one HDR preset that it defaults to when it gets a 4K HDR signal. However, in this mode it automatically sets BrilliantColor to 10, which is the brightest and lowest contrast option. You can reduce BrilliantColor in steps, sacrificing brightness and increasing contrast to your taste. We found a setting around 6 to be a more satisfying trade-off between brightness and contrast. Beyond this, these two projectors are programmed to interpret HDR signals differently. The UHD60 automatically applies an abundance of color saturation that some users will interpret as a rich image and others will consider overdriven. The HC 4000 is not programmed to push color saturation nearly to the degree that the UHD60 does. But by using simple adjustments of the Color sliders, you can increase saturation on the HC 4000 and/or decrease saturation on the UHD60 such that they end up looking virtually identical in saturation. Color balance in default calibrations is also different on these projectors. The UHD60 tends to show a noticeable bias toward yellow/green, which produces not only erroneous color but reduces contrast. Once the yellow/green is calibrated out, the picture shows improved contrast. Meanwhile the Bright Cinema mode on the HC 4000 (probably the one most users will opt for in HDR) tends to be slightly cool bluish, although it is not as noticeable as the color bias on the UHD60. Both models allow HDR pictures to be color adjusted, so the factory defaults don't say much about what they are capable of once fine-tuned. Assuming the Epson 4000 is in Bright Cinema mode and the UHD60's BrilliantColor is at 10, the UHD60 achieves a deeper black level on images that are predominantly black. For example, on the title screen of Lucy, the picture is entirely black with the exception of the white title LUCY. On this type of image the UHD60 shows a deeper black and higher contrast. As you add more non-black elements to the image the black level advantage and contrast differential disappears. So for example, the two projectors render the Universal Studios splash screen with much more similar contrast. In this case, the UHD60 has a subtle edge in black level, but it is not nearly as noticeable as it is on the Lucy title screen. In general, on an image with a range of elements from dark areas to bright highlights, the two projectors typically show very similar contrast. They can actually switch back and forth as to which is the higher in contrast within a given scene. SDR (Standard Dynamic Range): The Epson HC 4000, while competitive in HDR, has a definite advantage in SDR. There are several factors that may contribute to this. One is that there is less digital noise on the HC 4000 than on the UHD60. Though this does not appear as much in 4K, it becomes a more noticeable difference in SDR and 1080p source material. Second, the HC 4000 has a more substantial all-glass 16-element zoom lens. This lens was designed for Epson's more expensive home theater projectors, but is being used on the HC 4000 as well. Third, the HC 4000 has several levels of 4K Enhancement processing, along with SuperResolution and Detail Enhancement processing that was also developed for the pricier Epson home theater products. Though these sharpening features can be overdriven, they usually add detail clarity without imparting any visible edge enhancement artifacts. Fourth, with SDR sources there tends to be higher contrast on the HC 4000 than on the UHD60. This lends a perception of overall image sharpness that is independent of resolution. So in the end, the picture for most 1080p sources tends to be brighter, cleaner, and higher in contrast on the HC 4000. With respect to black levels, they can both beat each other depending on the black level you are talking about. As with HDR, with a predominantly black image such as a title screen or rolling credits, the UHD60 will deliver a deeper black than the HC 4000 will in Bright Cinema mode. However, the vast majority of video/film subject matter is not black. In a typical picture with subject matter ranging across the entire gray scale from black to white, the black elements tend to be as black and sometimes blacker on the HC 4000. The comparison can of course be altered by reducing BrilliantColor on the UHD60 or putting the HC 4000 into Cinema mode rather than Bright Cinema, or even adjusting the Brightness controls a point or two based on your personal taste. The bottom line is this: For any SDR source You can calibrate them to look virtually identical, or you can tweak either one to emphasize black level and color saturation at the expense of brightness. In terms of image detail and resolution, there is no difference at all in their display of 1080p sources, and almost no difference in the display of 4K SDR. Certainly the difference in image resolution of a 4K source is insignificant, and far less than you'd expect from the two different light engine technologies. Now of course at 24 lbs the HC 4000 is much larger and heavier than any of the 4K DLP models, and it has no audio on board. So it is not good for portable use of any kind. Brightness. Unless you are planning to view white text documents and financial spreadsheets, the ANSI lumen ratings and measurements on these projectors are meaningless for comparative purposes. The UHD60's RGBCY color wheel and the way it is programmed enables it to produce extra white light beyond the color light that it is capable of generating. So in a side by side test in their respective Cinema modes, a white text document will look very bright on the UHD60 compared to the HC 4000. Conversely, a full color video image with the same picture settings will appear brighter on the HC 4000 than on the UHD60. So for typical home theater use, the fact that the UHD60 measures 1260 ANSI lumens in full lamp Cinema mode while the HC 4000 measures 848 ANSI lumens is irrelevant. The UHD60 measures 54% color brightness (the combined luminance of red+green+blue) against white in Cinema mode. In practical terms, that means a full color video image will not be as bright as you'd anticipate from the ANSI lumen reading. For the record, the Epson 4000 is rated at 2200 ANSI lumens, and our sample measured a maximum of 2440 in Dynamic mode, the brightest option. The Optoma UHD60 is rated at 3000 ANSI lumens, and the sample measured a maximum of 2710 in Bright mode, also the brightest option. However, the Bright mode on the UHD60 has a very significant green bias whereas Dynamic on the HC 4000 is, by comparison, much closer to neutral in color balance. Moreover, once you put a full color video image on the screen instead of a white test pattern, the HC 4000 is brighter despite having a lower ANSI lumen measurement. Due to the three lamp power modes on the HC 4000, this projector gives you three brightness options in each mode. NOTE: Numbers in bold indicate default lamp power setting for each operating mode. You can switch lamp power to any of the three settings in any mode. Eco modes: The HC 4000 has three lamp modes, High, Medium and Eco. Medium reduces image brightness by 22% and Eco reduces it a bit more to 26%. Both of these lower light modes reduce fan noise considerably to very quiet. There is no incremental difference in fan noise between Medium and Eco. The Optoma UHD60 has a single Eco mode which reduces light output by 37%. Eco mode becomes an option when Dynamic Black is turned off. On our test unit there was a persistent flicker in Eco mode, indicating the light source or power supply did not like being run at that level. The picture is stable in Bright mode. Zoom lens light loss. Most zoom lenses transmit light most efficiently at their widest angle positions. In general, the longer the zoom range the more light is lost at the telephoto end. Although not always true, it is true with these two projectors. The UHD60 has a 1.56x zoom range and it loses 26% of the projector's light output at the telephoto end. The HC 4000 has a 2.1x zoom range, and loses 33% at the telephoto end. So if maximizing light output is a concern in your installation, try to position the projector using the wide end of the zoom range. Brightness Uniformity: The HC 4000 registers 87% uniformity with the lens at wide angle and 85% at telephoto. The UHD60 puts up 64% uniformity at the wide angle end, and 74% at telephoto. This is not unusual. In general we see three-chip light engines of all technologies, whether 3LCD, LCOS or DLP, producing higher uniformity than most lower priced single-chip DLP products. This is not to say that a single-chip DLP light engine cannot produce high uniformity-it certainly can if the designers make it happen. 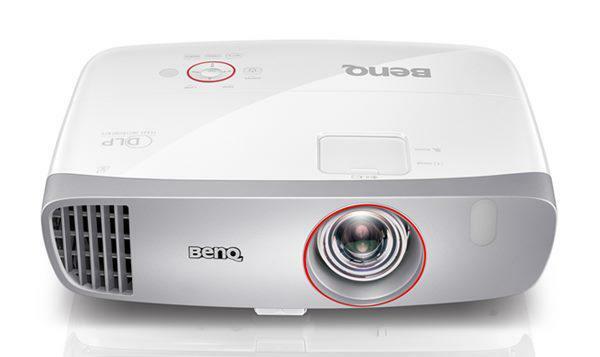 The Optoma ZU850 measured a whopping 90%, and the BenQ HT8050 measured 87%. But these are much more expensive units. There tends to be a correlation between the price of the single-chip DLP projector and its brightness uniformity, with the lower priced models not measuring as well on this particular metric. Rainbow artifacts. Some users of the UHD60 are likely to notice occasional rainbow artifacts due to the sequential color updating from the color wheel. These artifacts do not occur on the HC 4000 due to its three-chip design. Whether the potential rainbow activity on the UHD60 would be a problem for you depends on your sensitivity to them. Many people are not bothered at all by them and rarely notice them. Others find them distracting. Onboard Audio. The UHD60 has excellent audio, as good as we've ever heard from a projector. It will easily satisfy audio needs in a pinch if you are using it in an occasional portable set up, like a back yard movie night for example. Of course for large screen home theater 4K projection you will want a surround sound system for maximum impact. The Epson HC 4000 has no audio on board, so you must have an external system. Input Lag: The HC 4000 measures 28 ms with 4K Enhancement off, and 30 ms with 4K Enhancement activated. The UHD60 measures 63 ms in all modes including Game. Fan Noise: The Optoma UHD60 is a quiet projector and definitely quieter than the HC 4000 in their respective lamp power modes. If you drop the UHD60 into Eco mode the fan noise drops from low to almost silent. Similarly, if you drop the HC 4000 from High to either Medium or Eco, the fan noise is reduced to a nearly unnoticeable level. In High lamp, the fan noise on the Epson HC 4000 is best described in the low to moderate range, and you will probably become aware of it during quiet interludes in a movie if the projector is placed anywhere near the seating area. Dropping the HC 4000 into Medium lamp mode reduces the fan noise quite noticeably and puts it on par with the UHD60. There is no incremental advantage to the use of Eco mode, as the HC 4000's fan operates at the same speed in both Medium and Eco. The Epson 4000 will throw a 120" diagonal image from a distance of about 12 to almost 25 feet. You can check the Epson HC 4000 Projection Calculator for the throw required for your screen size. The Optoma UHD60 will throw a 120" diagonal image from a distance of about 12 to 19.25 feet. You can check the Optoma UHD60 Projection Calculator for the throw required for your screen size. As noted above, both projectors lose some brightness at the telephoto end of the zoom range, so in order to maximize light output, consider placing them as close to the screen as is reasonable in order to use the wider end of the zoom range. Vertical Offset. The UHD60 throws the image such that the centerline of the lens intersects the bottom edge of the image when the vertical lens shift is at its lowest position. From that point you can raise the image about 15% of the picture height using the lens shift control. Considering that most 4K projectors under $2000 have no lens shift at all, this is a welcome feature. At the same time, the relatively restricted offset and placement of the image suggests that most users will want to either ceiling mount the UHD60 or place it on a low table between the seats. If a table between the seats is preferred, make sure to provide adequate clearance for heat dissipation. The most problematic placement for the UHD60 is behind the seats on a rack or stand, or in a bookshelf, with projection over the heads of the audience. In this situation the fixed vertical offset will usually require a downward tilt of the projector to hit the screen, and the UHD60 has no keystone correction available to square up the resulting geometric distortion. The Epson 4000 has a much longer vertical lens shift range - it can place the entire projected image significantly above or below the centerline of the lens. This makes it ideal for placement on a stand or rack behind the seating area so that it projects over the heads of the viewers. The 4000 is too large for normal bookshelf placement, so a purpose built rack or stand behind the seating area, or a larger custom-designed shelf on a rear wall, would be the best options. The 4000 can be ceiling mounted or placed on a low table between the seats as well, so its vertical lens shift range gives it the flexibility to accommodate a variety of installation options. In short, all considerations of picture quality and other functional features aside, the decision to go with one or the other of these two models may be significantly influenced by how you want to install it. The Optoma UHD60 and the Epson Home Cinema 4000 are both highly attractive home theater projectors but for different reasons. Though the UHD60 lacks a lot of the features that the HC 4000 has, it has one obvious advantage, which is its ability to resolve finer detail in the 4K picture from a native 4K signal. In addition, it can (when both models are set to their most probable operating modes) achiever deeper blacks in images that are largely black such as title screens, rolling credits, and images of deep space in Star Wars. The UHD60 also has a quieter fan, which is mostly noticeable when they are both in full power mode. The UHD60 has the best onboard audio we've yet found on a home theater projector, in case you want to use it for occasional backyard movie nights. As far as portability goes, neither is designed for portable use, but the UHD60 at 16 lbs is smaller and much easier to move around than the 24 lb Epson 4000. And if you are going to ceiling mount your projector, the UHD60 requires a bit less muscle to get it installed than the larger and heavier HC 4000. The Epson HC 4000 generally outperforms the UHD60 with SDR source material in terms of brightness, contrast, and clarity. In most modes with SDR sources it is incrementally higher in contrast and color saturation, and black levels are a bit deeper. It comes with a robust frame interpolation system, which is a feature you can also get from Optoma by stepping up to the UHD65 for another $500. The HC 4000 has better brightness uniformity. It also has Full HD 3D and powered Lens Memory, two features of interest to some buyers that the UHD60 does not have. Overall the Epson 4000 is a bigger, heavier projector with more substantial build quality. And it has extensive powered zoom and lens shift range, giving the user some installation flexibility that is not available on the UHD60. At the end of the day, both the Epson Home Cinema 4000 and the Optoma UHD60 are highly competitive projectors even with the release this year of the newer and lower priced 4K models. They have completely different feature sets and performance advantages. Which one is best for you depends on the features you want most. It should be of note that you can't game in 4K+HDR or to be exact 4K@60p and 10bit color on the Epson 4000 (and the Epson 5040ub). The HDMI input only accepts 10.2gbps of bandwidth instead of the newer 18gbs bandwidth. It can only do 4K@24p w/ 10bit color or 4k@60p w/8 bit color. The PS4 Pro will just disable HDR unless you specify otherwise and do 1080p w/ HDR. The X1X it seems won't let you output HDR at all sadly. Arnold, can the Epson 4000 do 4K@60p 10bit color upscaled from 1080p? I have a PS4. This seems like the ONLY project with sub 30ms input lag and show movies in 4K. Arnold, I have the HC4000 performing fine in HDR mode at 4K@30fps from an Apple 4K UHD TV media server, as well as from a new PC with NVIDIA Quadro 600 display card running original 4K UHD HDR material at 30fps, 10-bit color, 4:4:4 and 4:2:2.. It also tests out fine at 4K@30fps HDR, 10-bit color 4:2:2 and 4:4:4 using a Muridio 6G pattern generator. So it is not limited to 24fps in HDR mode as your article states. My major concern with your review is lack of color gamut and color accuracy info in either SDR or HDR modes. Assuming you didn't test either based on your comment. Why isn't the smaller REC.709 gamut of the UHD60 (which can ONLY be achieved 100% in its dimmest Reference mode) a negative factor for the UHD60 compared to the +100% DCI-P3 ultra wide gamut achievable in the HC4000 in its Cinema and Digital Cinema modes? (Based on my CalMAN 5 gamut tests using an XRITE i1 Pro spectrophotometer.) To most viewers, color saturation, accuracy, and contrast make a bigger impression than the minor differences between these two in resolution--and it's hard to miss the advantage shown by the Epson's +100% DCI-P3 gamut coverage. Very helpful review. Can anything further be added regarding out of the box color accuracy on the HC4000? Based on your review of Epson’s 5040ub, it sounds like that model has pretty good color accuracy. Is the HC4000 close or is the 5040ub significantly better in that regard? Does "Automated Lens Memory for 2.4:1 constant image height Cinemascope installations" mean you can watch 2.35.1 content even without a cinemascope lense adapter? Andrew, the Lens Memory system lets you set up a 2.4:1 Cinemscope screen, and automatically have the zoom lens reset its position based on the aspect ratio of the content. So 2.4:1 content will be displayed full frame, and 16:9 and 4:3 content will be displayed in the center with the picture filling the frame vertically. This is referred to as a "constant image height" installation. It is intended as a substitute for an external anamorphic lens. Dan, there is not any significant difference is color balance between the 5040UB and the 4000 that would cause you to choose one over the other. The primary difference of any consequence is in black levels and contrast. I'm a little confused at the prospect of 4k gaming based on the first comment. I'm considering this projector with a PS4 Pro in mind and gaming would be a large portion of my use. Can someone explain if a PS4 Pro 4k set-up is feasible and worth the extra cash for this projector? Otherwise I'm looking at the 3100 or 3700. Thanks. If you want to do HDR gaming on the Epson HC4000, you would need to buy an HD Fury Linker so that the xbox one can still send the signal at 4K@60p and 10bit color to the linker. The linker would then send the signal to the Epson at 4K@60p and 8bit color (epson can't handle 10 bit with 4k@60p). John, I play my 4K movies on my Xbox One S on my Epson 4000 and it looks great. It's able to display HDR. But if you want to play games or stream movies in HDR through your Xbox One S, you would need to buy an HD Fury Linker. Please see my previous post. I take it that with the video mode of 2160p/60 this will stream Netflix 4k from an Nvidia Shield TV? Anyone been successful (or not) with this setup?